The dream of most golfers is being followed down the 18th fairway on the final day of the Open Championship by enthusiastic spectators all crowding around the green to watch the crowning of a new champion. However, not even the best players in the world are that thrilled about the presence of too many people as it can cramp their style, but it’s something that they have to accept as part of the sport’s huge popularity. Your average Joe, on the other hand, can choose whether he or she wants to bask in the splendid isolation of being alone on the tee or teaming up with one or more partners. 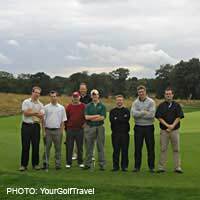 The chances are that if you enjoy playing as a group, then you are going to head off to virgin golfing territory as part of the same group. And there are main advantages to doing this. For a start, the price of the package may be reduced because doubles inevitably are more economical than paying for a single room supplement. Pooling equipment and clothing may save on excess baggage charges at the airport. Green fees, too, may work out cheaper as part of a group, and should you find that you’ve hit all your balls into the oblivion of the nearest patch of rough, then it is easier to coax a few spare balls out of one of your companions than trudging disconsolately back to the clubhouse or chancing your questionable grasp of the local lingo by asking a course regular to help you out. Of course there is a flip side to all this, namely being perfectly content with your own company on and off the course. For a start you can play at your own pace, and at a time of day that suits you rather than the pushy member of the group who always seems to get their own way. Then, there is the tiresome business of one or more companions being rather more competitive than usual. This usually leads to temper tantrums and ill-feeling that can take the shine off the rest of the break. That’s assuming the more highly strung haven’t already packed their bags and headed off to the airport in a huff. And what about when you return home and cross paths in the clubhouse of the local club? Remember that many a beautiful friendship has suffered irreparable damage from the closer than usual proximity to one another that sharing a holiday or hotel room entails. Most of the dividends gained on the course from travelling solo are equally applicable on a social level. Billy or Brenda No Mates you may be, but there’s no suffering loud bars and mediocre food in the name of group democracy. And no tiresome drinking competitions that mean you are teeing off next morning with a thumping headache. Whichever route you take, solo or as part of a group, ensure you return relaxed and ready to make your fellow members green with envy with your newly improved skills.